SUMMIT Service Management with its multi-tenant architecture and high configurability, can be used across multiple functions such as HR, Finance, Facilities, Marketing, and Procurement etc., each with their own SLAs and Service Catalogues, thereby truly making it an Enterprise Service Management Solution. SUMMIT Service Management. Symphony SUMMIT is the leading provider of private and public cloud based IT Operations Management Solution to enterprises and service providers. It is one of the 20+ global companies backed by the Symphony Technology Group (STG). STG is a strategic private equity firm focused on transforming high-potential companies into definitive market leaders. End users can create Incidents for multiple instances/ departments. Users can view all the incidents logged by them with the status details. They can view all the important updates about their department under Bulletin Board. They can search and view Knowledge Records for self-help. They can view the Response and Resolution SLA details for their respective incidents. 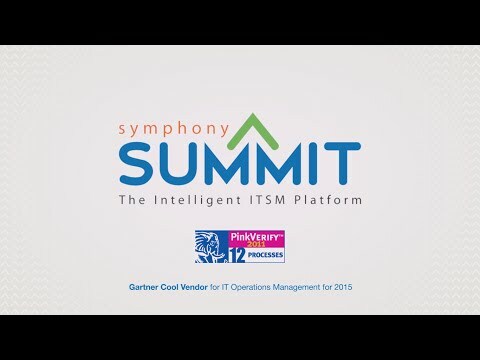 Symphony SUMMIT provides a comprehensive cross-module solution that helps reduce the cost and complexity in managing your IT environment and delivers greater ROI for your investment. Get the SUMMIT Edge.